The development and application of evidence-based, innovative interventions is informed by a specialist team of clinical and academic staff. For an overview of PIRI’s research, click here. Click on PIRI staff for more details. Click on PIRI Newsletters for our news. Research (basic and clinical) – To conduct internationally recognised research into perinatal depression and anxiety, prematurity, infancy, prevention and intervention; to disseminate results through publications (academic journal articles and books) and conferences, as well as to parents. Major research initiatives relate to improving parent mental health and optimizing infant cognitive, emotional and social development. Click here for more on PIRI’s Research. Model Clinic – The clinic supports our clinical research trial centre and also rolls out evaluated Parent-Infant Research Institute (PIRI) programs as a model treatment centre (the Infant Clinic) for perinatal mental health difficulties (antenatal and postnatal anxiety, depression, adjustment problems and parent-infant difficulties). Public Health Initiatives – To increase the evidence base for screening for perinatal depression; enhance community awareness and reduce stigma of parent and infant mental health issues; perinatal treatments from conception to 2 years. Policy – To provide high quality information to influence government policy, advocate for parent-infant well-being and for the translation of research knowledge into real-world services. Training – To engage with agencies and professionals in collaborative relationships, and provide state-of-the-art training in assessment and treatment of parent-infant difficulties. PIRI is committed to supporting all parents and their babies (conception to 2 years), including those with vulnerabilities, to have the best possible start to life by creating a Centre of Excellence whose activities are designed to improve emotional wellbeing and optimize development. For PIRI’s full Mission Statement, click here. PIRI is an international leader in postnatal depression research and is engaged in active collaboration with groups in Australia, the UK and US. 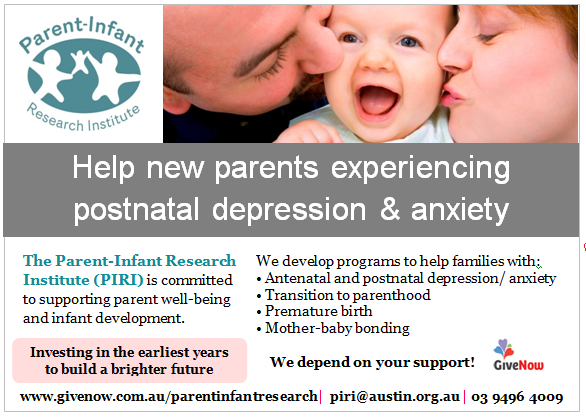 PIRI is Australia’s largest treatment research centre for antenatal and postnatal depression, with a track record of turning research into practice and developing novel parent-infant interventions, training professionals in parent-infant mental health and with expertise in prematurity. PIRI’s 15-year history of developing interventions for parent-infant difficulties following postnatal depression has resulted in a suite of evidence-based programs. Programs include the “Getting Ahead of Postnatal Depression Program”- the only Australian psychological CBT treatment for postnatal depression evaluated in a randomised trial – the program has international recognition (translated into Italian and French). Other programs include “Towards Parenthood” and “The MumMoodBooster” Online Postnatal Depression Treatment Program. PIRI has led cutting edge research in prematurity and the effect of parent-sensitivity training on brain development, with successive funding from NHMRC grants. Involvement with beyondblue since 2001, initially as Victorian Principal Researchers for the beyondblue National Postnatal Depression Program and screening of over 10,000 women in Victoria and Tasmania. PIRI has played a key role in implementation of the Federal Government’s Perinatal Depression Initiative for universal screening of all antenatal and postnatal women for depression and anxiety in Australia. PIRI continues its relationship with beyondblue, recently collaborating in the development of online training for screening of postnatal depression. Developing screening programs for postnatal depression through an extensive network of over 500 Maternal and Child Health Centres with whom we have collaborated. PIRI offers training to build capacity in the perinatal workforce to manage antenatal and postnatal depression. This includes provision of extensive training to MCHNs in the Northern Eastern and Hume Regions as part of the DHS PND Initiative link to clinical Services, and a statewide tender with DEECD. Perinatal Depression eConsortium (PDeC) – Led by the Parent-Infant Research Institute (PIRI) in partnership with Perinatal Anxiety and Depression Australia (PANDA), Monash University, Jean Hailes for Women’s Health and Queensland University of Technology. Evidence-based online resources and apps have been evaluated by PDeC and are available through MumSpace.com.au. PIRI consists of an Advisory Board and a dedicated group of clinical, academic and research staff whose aim is to conduct research and provide world-class services to women and their families, health professionals and other researchers in the area of parent and infant mental health. PIRI’s work is conducted under two arms, consisting of (1) a research arm which provides a ‘hothouse’ of parent-infant researchers and informs and underpins all PIRI activities, and (2) a clinical unit, the Infant Clinic, which provides model world-class treatments, and provides support to women and their families, health professionals and other agencies in the area of parent-infant mental health. 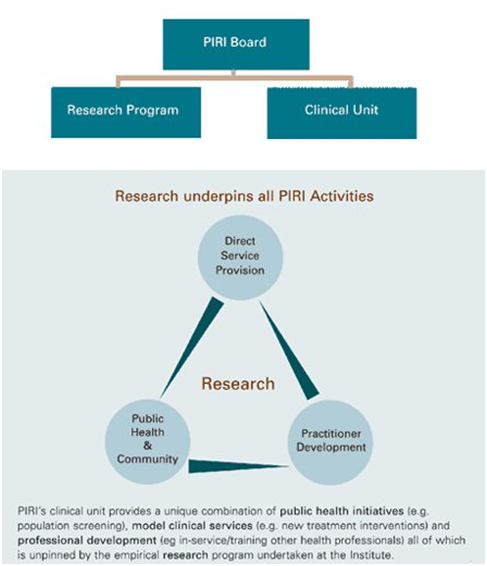 PIRI also conducts public health initiatives and professional development programs. PIRI is staffed by clinicians and research staff with expertise in infant, child and adult psychology, research methodology, randomised trials and dance therapy. PIRI is renowned for its innovative clinic programs. Staff have published extensively in the scientific literature in the areas of child development, mother-infant interaction and treatment of antenatal and postnatal depression and prematurity. Profiles of the PIRI Research and Infant Clinic staff can be viewed here. PIRI provides information, training and resources for health professionals, which can be accessed in our Information for Health Professionals section. If you are a parent, friend, or relative looking for support or information, see our For Parents page.